Two men have been ordered to pay £400 fines after being caught fly-tipping in the Harborough district. The men, both residents in the district, have each been issued with a £400 fixed penalty notice by Harborough District Council, after being caught in separate fly-tipping incidents. The first incident took place in January 2018, where a man dumped household rubbish, including a washing machine, in a gateway to a field in Gartree Road, Little Stretton. 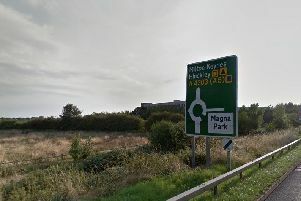 The second incident took place in February 2018 when six bags of soil were dumped, over two weekends, in a layby along the B6047 at Tilton on the Hill. This incident was captured on one of the council’s covert mobile CCTV cameras – positioned at fly-tipping hotspots across the district. Last year Harborough District Council launched it’s ‘Tip Off’ campaign aiming to raise awareness of fly- tipping and its impact on the district. - Use the district council’s bulky waste collection service. This allows for up to three large household items or 12 sacks of waste to be collected for a charge of £33.